Sharing special moments in your own backyard is easy with the PPU-450-U offset Patio Umbrella from CorLiving. This versatile offset umbrella can be used to create a comfortable shady spot on your patio. Made with a durable steel frame and a UV resistant umbrella fabric this product looks great and is ready to withstand the elements of the outdoors. With only simple assembly needed upon delivery, means you can create your place of shade in minutes. Create a comfortable patio with this wind-resistant tilting patio umbrella. The adjustable rotating-tilt mechanism allows you to block the sun at any angle, ensuring you stay cool at all times. Constructed from a UV and weather resistant fabric, this patio umbrella also features a vented canopy for added stability. Unlike other patio umbrellas, the crank and pulley, and rotating tilt is lower down, making it easy to reach. 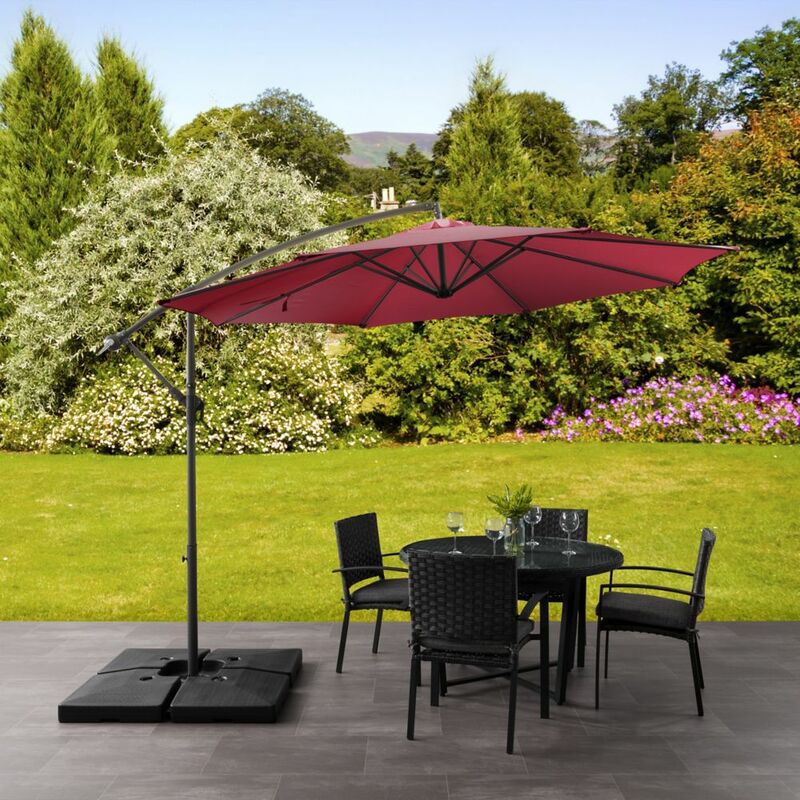 Offset Patio Umbrella in Wine Red Sharing special moments in your own backyard is easy with the PPU-450-U offset Patio Umbrella from CorLiving. This versatile offset umbrella can be used to create a comfortable shady spot on your patio. Made with a durable steel frame and a UV resistant umbrella fabric this product looks great and is ready to withstand the elements of the outdoors. With only simple assembly needed upon delivery, means you can create your place of shade in minutes.